Cloning is a bad idea and Australian animals will kill you. …At least, this is what Canberra filmmaker Christian Doran would have you believe. And he’s just been awarded an arts grant of $10,000 from the ACT government to help convince you. Inspired by the works of Isaac Asimov, movies like 2001: A Space Odyssey and television shows such as Battlestar Galactica, this sci-fi film buff is hoping to bring some futuristic flair to the nation’s capital. Doran will be refining two feature film scripts with Regina Lee, an Australian script editor who’s worked on Hollywood film franchises like American Pie and Wolverine. “She’s seriously an incredible woman,” says Doran. Luminous is a ‘smart sci-fi’, which, Doran explains, means it’s low budget. The story is all about relationship drama, a love triangle between two scientist buddies, one of whom is in love with the other’s wife. Naturally, they decide to develop a cloning technology so they can both be with the woman they love. Sounds like a failsafe plan right? HA HA WRONG! Inevitably, things don’t pan out as expected, and both the clone and the original start dying as it turns out they cannot coexist. Ultimately the scientists must choose who will live and who will die in what’s sure to be a dramatic and heart-wrenching moral dilemma. “This one can definitely can be shot in Canberra,” says Doran. On the other hand, Terror Australis is more of a fun, shoot ‘em up film. 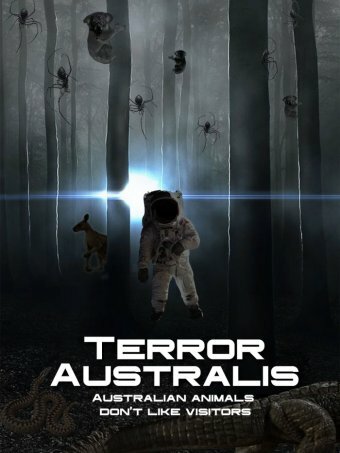 A bunch of astronauts crash the international space station into the Australian bush, and are infected by an alien virus which makes them increasingly more aggressive. But here comes the best bit. The Australian animals, sensing the foreign virus, begin attacking the astronauts in a glorious bloodbath. “The idea came to me while I was travelling, because everyone’s impression of Australia is that it’s full of crazy animals that are going to kill you,” says Doran. With spiders, snakes, kangaroos, crocodiles, sharks and jellyfish all set to make an appearance, Terror Australis is sure to confirm everyone’ worst nightmares about the harsh Australian environment. Doran is planning to film Luminous in 2016, and then leverage that project to raise funds to produce the higher budget Terror Australis. What do you think of these two film ideas? Would you watch Luminous or Terror Australis? Would you like to see more sci-fi projects realised in Canberra? At least, this is what Canberra filmmaker Christian Doran would have you believe. And he’s just been awarded an arts grant of $10,000 from the ACT government to help convince you. With the town council so heavy in debt, shouldn’t they pull the purse stings in a bit? Terror Australis… That’s the best movie title I’ve heard in a while. Sounds like a cool project. Good luck Christian!